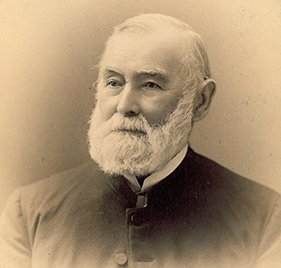 Benjamin Harrison (1833-1901) is the son of John Scott Harrison (1804-1878) and Elizabeth Irwin Harrison (1810-1850). Click on the individuals to see a pedigree chart or family group sheet. You will need Adobe Reader to view the files. Benjamin Harrison’s great-grandfather, Benjamin Harrison V, was born in Berkeley, Virginia, in 1726. He attended William and Mary College in Williamsburg. In 1764, when the House defied the Royal Governor and passed the Stamp Act Resolutions, the Governor tried to bribe Harrison with an appointment to the executive council. He refused the appointment and instead declared a devotion to republican principles. Elected to the Continental Congress in 1774, he was one of a party of representatives who, the following year, attended General Washington in Cambridge to plan the future of the American Army. He had reservations about the Constitution, a document which seemed to promote kingly power while increasing the mistrust between southern and northern countrymen. A slave owner himself, his great-grandson would be a Union soldier 80 years later. He was elected Governor of the State of Virginia in 1782. He retired from the Governor’s office after five year of service. He died in 1791 at the age of 65. 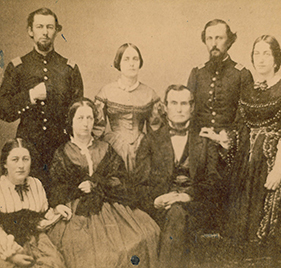 William Henry Harrison, Benjamin Harrison’s grandfather, obtained a commission as ensign in the First Infantry of the Regular Army, and headed to the Northwest. In the campaign against the Indians, Harrison served as aide-de-camp to General “Mad Anthony” Wayne at the Battle of Fallen Timbers, which opened most of the Ohio area to settlement. In 1798, he became Secretary of the Northwest Territory. In 1801, he became Governor of the Indiana Territory, serving 12 years. The Battle of Tippecanoe, upon which Harrison’s fame was to rest, disrupted Tecumseh’s confederacy but failed to diminish Indian raids. In the War of 1812, Harrison won more military laurels when he was given the command of the Army in the Northwest with the rank of Major General. The Whigs nominated him for president in 1840. He won, but before he had been in office a month, he caught pneumonia and died. John Scott Harrison, Benjamin’s father, was born in Vincennes, Indiana, October 4, 1804. He managed affairs at North Bend, Ohio, while his father was away. From 1853 to 1857, he served in the United States Congress in the House of Representatives as a Whig from Ohio. This was a tremulous time and John Scott stood firm on issues like the Kansas-Nebraska bill. He believed that it was necessary for mutual forbearance and compromise, in order that the Union might be saved. John Scott retired from politics and return to his estate at North Bend. He died on May 25, 1878. Caroline Lavinia Scott Harrison (1832-1892) was the daughter of John Witherspoon Scott (1800-1892) and Mary Potts Neal (1803-1876). Caroline was the first President General of the Daughters of the American Revolution (DAR). 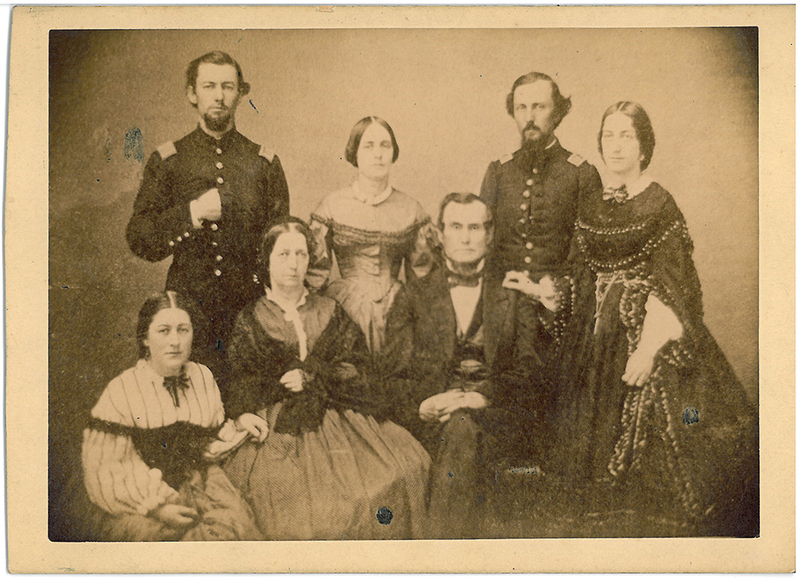 John W. and Mary Scott had six known children: Ann Eliza (1826-1827), Elizabeth Mayhew (1828-1889), Caroline Lavinia (1832-1892), John N. (1836-1898), Henry M. (1838-1877), and Mary (abt 1844-1872). John Witherspoon Scott was the son of Rev. George McElroy Scott (1759-1848) and Anna Rea (1773-1852). 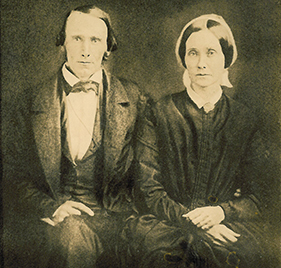 John Witherspoon Scott was born in Beaver Co., PA. on January 22, 1800. 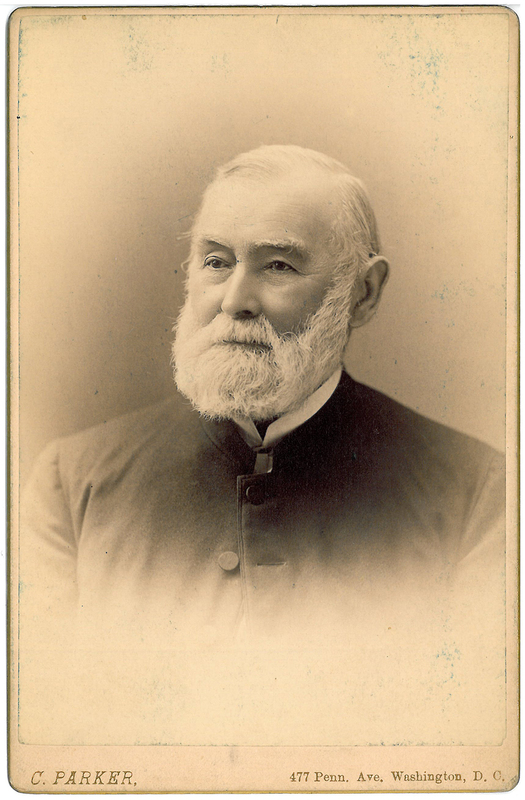 George McElroy Scott was the son of John Scott and Agnes McElroy. John Scott served as Commissary General of the Pennsylvania Line during the Revolution. Anna Rea was the daughter of Samuel Rea and Ann McCracken. Samuel Rea served in the Revolution (Sixth Battalion, Northampton Co., PA militia). Mary Potts Neal was the daughter of John Neal (1774-1854) and Mary Elizabeth (Eliza) Potts (approx.. 1781-1830). Mary Scott Lord Dimmick Harrison (1858-1948) was the daughter of Russell F. Lord (1802-1867) and Elizabeth Mayhew Scott (1828-1889). She is the granddaughter of John Witherspoon Scott (1800-1892) and Mary Potts Neal (1803-1876). 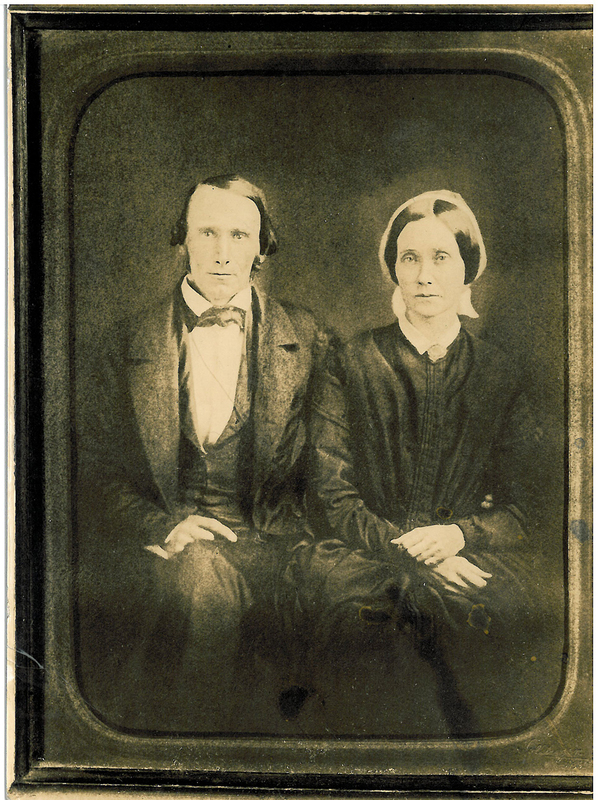 John W. and Mary Scott had six known children: Ann Eliza (1826-1827), Elizabeth Mayhew (1828-1889), Caroline Lavinia (1832-1892), John N. (1836-1898), Henry M. (1838-1877), and Mary (approx. 1844-1872). Mary Potts Neal was the daughter of John Neal (1774-1854) and Mary Elizabeth (Eliza) Potts (abt 1781-1830).